you know I should have mentioned this a long time ago, but quite awhile back, Konda of MooseQuilts asked for peeps to sign up for her Jelly Roll Sampler Quilt-a-Long, and I made it aboard the Jelly Roll train. But I was the last block on the journey, and well….all my other projects “helped” me forget about it…..But the last block is showing on Konda’s blog this coming week, because I got it done just in time… Here are the three versions I did up for the Sampler Group. I had so much fun doing these actually, that I came up with 3 different layouts in 3 different color schemes within 2 days, and I have decided that they will be among my first PDF patterns to come up for sale in online shops this fall/winter….all three layouts in one pattern, pretty good deal, yes?? So part of the deal is that there are prizes involved with this Quilt-a-long, and Konda is offering prizes over at her site, and I am offering this prize of a Hello Betty Jelly Roll in the same colors as the middle picture. Just drop a comment here and tell me what your favorite new fabrics or patterns (or whatever quilty thing you love) are this year. I will do a drawing on the 10th of August from all the comments. Thanks for stopping by, and don’t forget the Name the Prop Girl Contest here….Contest entries will be closed on the 5th of August Midnight Pacific Time. Great prizes to be had on that entry as well!! Let’s see…there’s Far Far Away 2, and there’s Pure and there’s Bliss and there’s Fandango…etc. etc. It’s a very good year. Scott, love the topmost block and third one very much. I’m a pushover for Joel Dewberry fabrics. Of course while in Dallas, TX I saw an incredible fabric that looked like psychedelic moss, but now can’t find it anywhere! Can’t wait to see your patterns. Thanks, Kevin, great to hear from you, Dude! It has been a very good year for new fabric lines! I really like Kaffe Fassett’s recoloured Liberty prints … Thank you for the giveaway! I’m new to quilting so I haven’t bought a lot of items, but I love the look of the moda and kona fabrics. Oh I’m loving Bliss! I like your layout for the new block. Vera’s garden offers nice contemporary colors and florals I think you’d like too. It’s a little outside my box, but I need to grow! I can’t wait to get Meadowsweet II — those are some of my fave colors. Thanks for another great giveaway! I really love those blocks. I’m planning a new quilt and I think that would be a cool way to do some of the blocks. I love Moda’s Frolic line. It is one of my all time favorite lines. I really like the last block you designed! My favorite quilty thing this year has been doing the Jelly Roll Quilt a Long with Konda. Can’t wait for another one. It’s been a great way to expose us to different designers. Thanks for the drawing. I am really new to quilting, so everything looks new to me, but I am really enjoying all the Halloween fabrics right now. I also saw one just this morning that was interesting, The Civil War Ladies from RJR. That is a new look that I haven’t explored. I really like your block, by the way, I think it’s my favorite from the ones we have done. I am in love with this block! Great way to finish the quilt along. I am also in love with Deb Strains Salt Box Harvest for this fall. I’m loving Castle Peeps…Thanks for the great give-away. I am enjoying your blog!! I love Anne Sutton’s Lily and Will line and too many others to list. My favorite new toy is my Creative Grids 60 degree Double Strip ruler. I have been happily sewing 2.5 inch strips and turning them into hexagons. It’s too much fun to be legal. My newest two quilty love items are my AccuQuilt GO! cutter which makes cutting easy and accurate AND the Olfa Frosted rulers that resist sliding. Both make my limited quilting time more productive. My current favorite is Martinque! Although, there are lots of fantastic fabrics out there right now! I am loving Oliver & S’s City Weekend as well as the (completely unrelated) Marylebone and Fulham Road lines. I love the block you designed. I really like Kris Lammers’ Through the Woods for Maywood and Jo Morton’s Sugar and Spice for Andover. I like the first one in the red and black. Looks neat. Now that this jelly roll BOM is over I’m going to start on the Farmer’s Wife blocks. I’m just starting to learn machine quilting so I’m really getting into all the stencils and continious motion designs that are available! I love bright retro looking fabrics … but I can’t remember the name of the line right now! I like making up my own patterns to use up every last scrap of fabric, and planning them out on graph paper. I’ve really enjoyed this quilt along and look forward to making block #12. My favorites, so far, has been blocks #5 & #6. It’s my first time working with jelly rolls, so I’m learning how nice it is to not have to cut the 2 1/2″ strips from selvedge to selvedge–such a timesaver! But the best part is choosing the fabrics that will show the block to it’s best advantage. 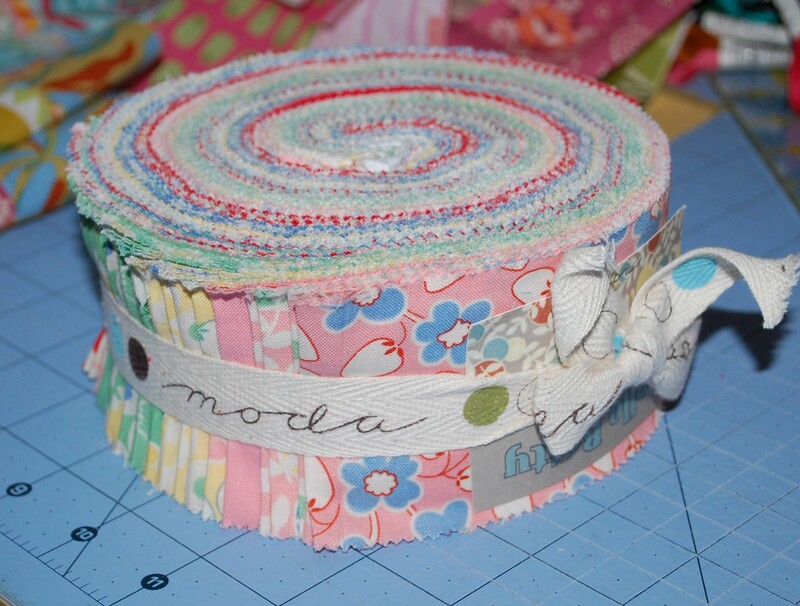 It’s a little more challenging for me, since I’m using a scrappy jelly roll. I love a good challenge. By the way, there are at least eight guy quilter’s in my quilt guild and they are all great quilter’s–most award winners. So, you may know some of them. I suppose men do not get into quilting unless they are truly passionate about it, since quilting is generally viewed by most as a hobby for women. Hogwash! I’m glad to have found your blog and will be checking it regularly. By the way, I am so jealous that you get to design quilts for the fabric lines. That sounds like a dream job to me–something I’d probably do for free. What a surprise to see you as the designer of the last block for the JRQS! Lots of beautiful fabric lines. I really like Eva, Make Life, Tweet Tweet, Castle Peeps,…. As for patterns: I am in the process of using your Lantern Bloom pattern with Brown / Earth Colors – and it is coming along nicely! It’s for my aunt and though I am not into Browns, it has grown on me; very much so! So far I have never really worked with skinny and big blocks in one quilt – and I love it! I am with you: Isn’t it amazing how different a pattern looks in different type/ color fabric? What I would like to see this year are more Betty Boop fabrics. My son has me making him boxer shorts each time I find a new print. He wants more…. I’d liike to surprise him with a Betty Boop pillowcase at Christmas. Oh I love that fabric! Anything 30’s repros I love, but of the new lines I love the Fruitcake Christmas fabric. Just too pretty! My favorite new fabric is Mason de Garance by French General. Thanks for the jelly roll block. Take care! My favorites are the Bella solids – who wouldn’t , they are timeless. I like Paintbrush Studios: A Division of Fabri-Quilt’s Bells Flora by Judy Hansen. Thanks for the great give-a-way! 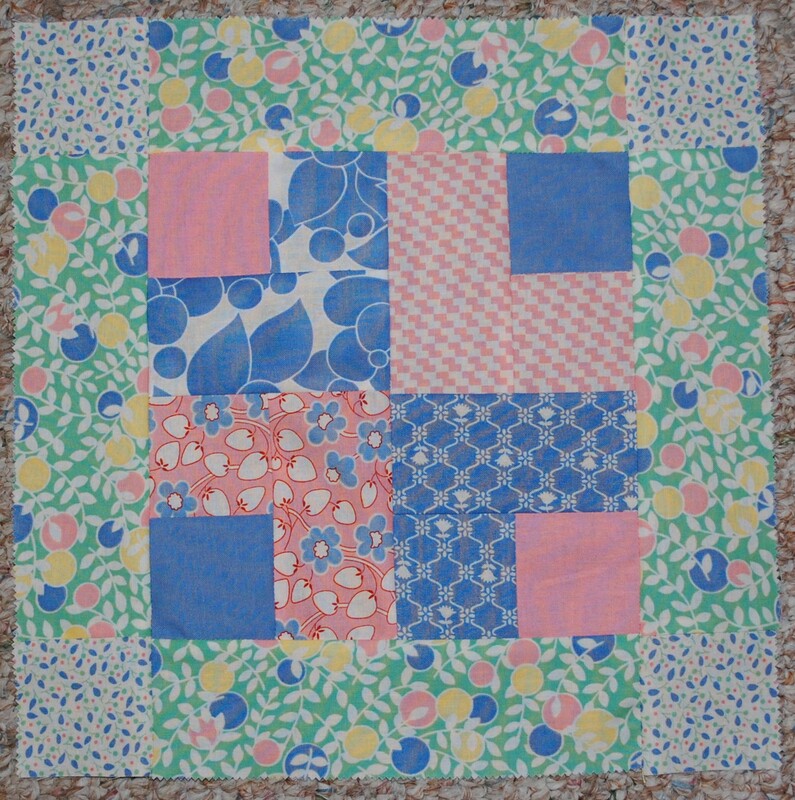 Love this block; favorite fabrics got be Kaffe Fasset and Joel Drewbarry. My favorite new line is Kansas Troubles Summer’s End; but I am also a huge fan of anything Moda, 30’s prints, and civil war fabrics. Gotta have some versatility or all the quilts would look alike lol. Loved the way you showed how different fabric lines work in the same block in your 3 examples of your block #12 of the Jelly Roll quilt along. There are so many great fabrics out this year, it is hard to pick a favorite. Right now, at this moment in time, I am in love with Pure! I just finished a top with an Abbey Lane pattern and can’t wait to get some yardage to finish the quilt. But tomorrow, I’ll have a new favorite…. I have had a great time with the JRSQA; I love your block and can’t wait to make it tonight! Thank you for the great Cornerstone Block. The Jelly Roll Quilt-Along has been exciting with so many great designers! Blocks were easy and fun, just the way I like them. When it comes to fabric, I can’t choose just one, I love everything from 1800’s to modern. Nice to get acquainted with you and have book-marked your blog so will be visiting often. Congrats on all your accomplishments! Love Pure! So fresh, but I love just about anything that comes out. Fabric is my passion! I just discovered your blog through sugarstitches.com — what a delightful find! As for what I’m most looking forward to… hm… that’s tough! I love Punctuation and Dream On and anything French General! I really like the Moda Frolic and even made myself a purse out of it – Amanda’s purse. Love your block. 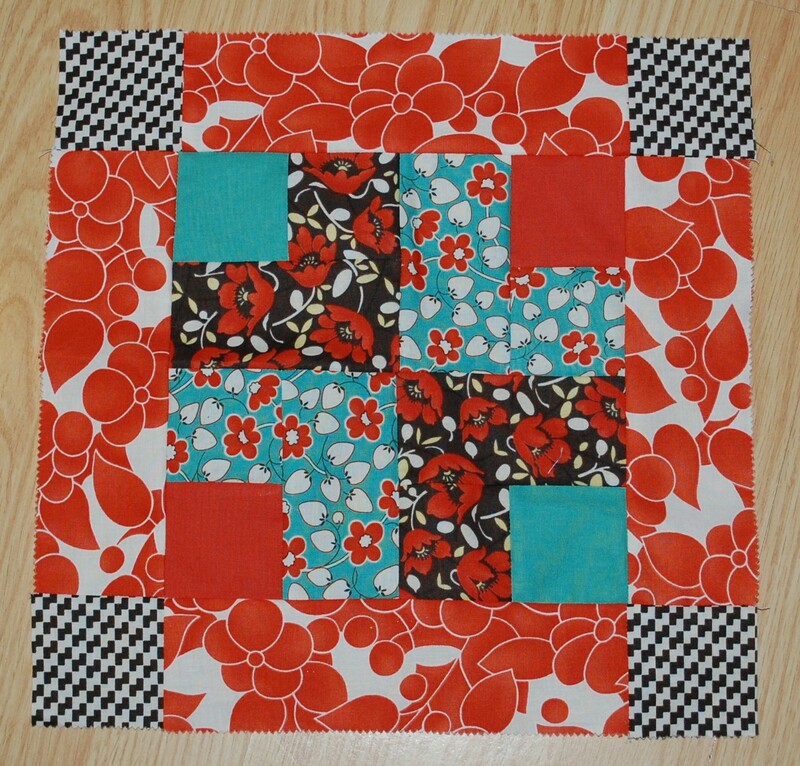 Oh, I really like your block….so easy but versatile; and I am enjoying Konda’s jelly roll quilt-along too. My newest quilty thing I love is this new ruler I got at a recent quilt show where you can cut several triangles in a row without moving the ruler…any time-saving tool like that is great! Right now my favorite quilt pattern is a disappearing 9-patch…very versatile depending on fabrics used & color placement. AND I really love the Hello Betty jelly roll you’re giving away. If I don’t win it, I’ll have to go buy it….it’s really “my” colors. Thanks for a great blog! these fabrics are so pretty. i love the ginger blossom fabrics too, i love bright colors. My favorite fabric line right now is Moda Blush. It’s just so beautiful. I am drying up in this heat wave and am trying to surround myself with winter holiday fabric. Love Moda’s fruitcake. Makes me forget (almost) about the triple digits here in Maryland! My favorite new/current line is City Weekend by Oliver & S.
I was introduced to Charms & Jelly Rolls this summer & I’ve become addicted! LOVE THEM. 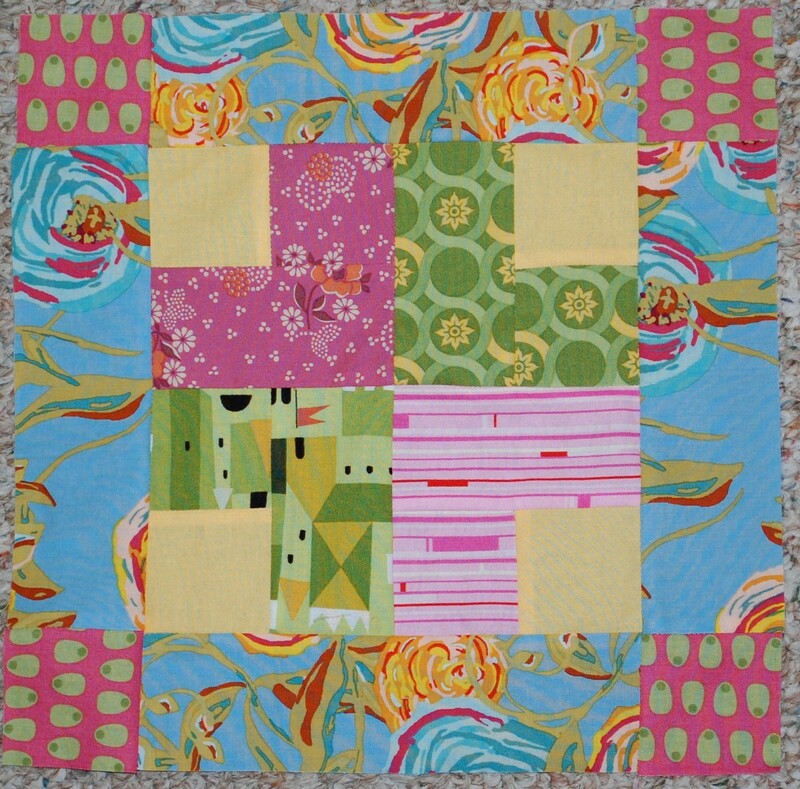 Joined Kondra’s Jelly Roll Quilt – what fun – yours is the last block to make – it will fit nicely with the rest. So winning another jelly roll would be great. Thanks for having so many fun giveaways. I just love fabrics so really can’t pick just one. Have just bought the paper doll for Christmas. Have enjoyed this jellyroll sampler and all the designers. SAd to see if finish. I’ve been smitten with the Bliss line, anything by Heather Ross, and this new retro line called June’s Backyard. I guess I don’t have a defined style! I love HST rulers… I don’t have one but have severe envy. I also love the new range of Austrlain wildflower fabrics… I discovered them in the Aussie Rolls jelly roll I am using in the Civil War Scrappy (waiting for inspiration to strike for a more apt name… Suggestions welcome!) I am making. I LOVE FABRIC!! So it’s really hard but…right now I am smitten with the Monaco line from Monaluna. I love the design! Meadowsweet 2, Castle Peeps, Pure, Fandango, Modern Meadow, anything Kaffe, Kona solids and city quilts patterns, Elizabeth Hartman and Kate Conklin patterns, Tweet Tweet, Kate Spain’s 12 Days of Christmas, Swoon (to come), and some Australian organics, and Pat Bravo’s Art Gallery fabrics. There are other fabrics that are not as new that I like too – Hope Valley and Martinique. Thank you for your giveaway. The jelly roll designs look wonderful, yet I’ve never worked with a jelly roll. I don’t care what kind of fabric it is or what color or who makes it; I’m totally into BOMC’s because every month something new comes and it’s a surprise and I get to turn it into a block. I have so many different projects going I need a file clerk to keep them straight. New fabrics I am lovin’…Modern Meadow, Collections for a Cause – Hope, Maison de Garance, Arnold’s Attic, it’s an eclectic bunch.